What a privilege to go to Ukraine for the 11th time in June of this year! This marked a very different trip in many ways. 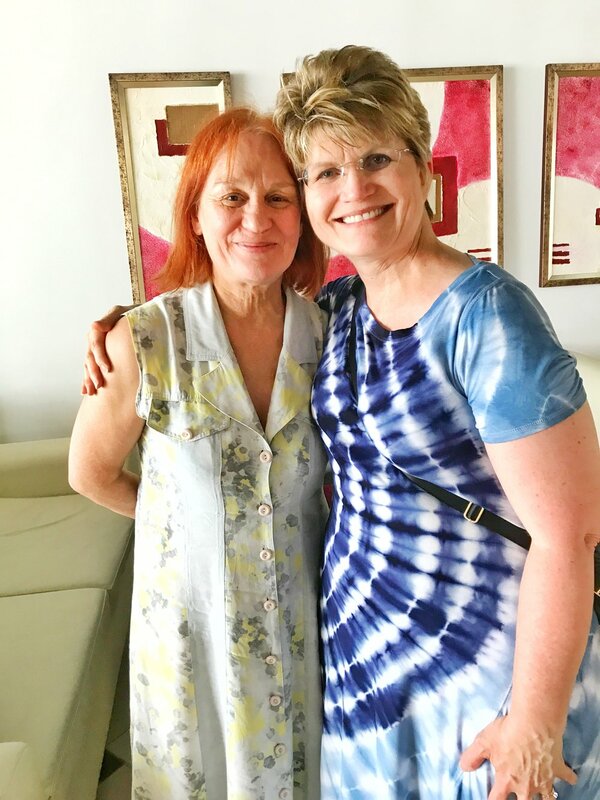 Our usual team felt God moving in different directions, and so I ended up going with a new friend, Julie, and we went for the expressed purpose of finding a vision for what our church could do for the women in the L'viv region. This was Julie's first time going to Ukraine (and for going out of the USA, for that matter!). It was awesome to get her perspective of the country and the people from her fresh eyes. We were honored to attend the annual women's camp as our church has had the privilege to sponsor it for the last seven years. This was the 8th camp.....and sadly, will be the final camp we finance as we move in a different direction. There were 95 women in attendance and it was an awesome experience for all! Speaking of decorated cookies.....we found a new cookie shop in L'viv that is loaded with beautifully decorated gingerbread cookies. When we started going to Ukraine 10 years ago, no one knew what a decorated cookie was. But obviously, the idea has stuck and they have run with the idea of selling decorated cookies! I always take loads of small cookies with me to share with everyone I meet....and this year's trip was no exception. I went the easy route and did marbelized, dipped cookies. What a joy this trip was. So many good memories and delights to recount. I'm not certain that I'll return to Ukraine.....but I AM certain to remember these last ten years with deep gratitude and pleasure. Thank you for being a part of my ministry as you support this site and all my cookie decorating efforts. I appreciate all of you! Cookies Ready......Ukraine Here I Come! 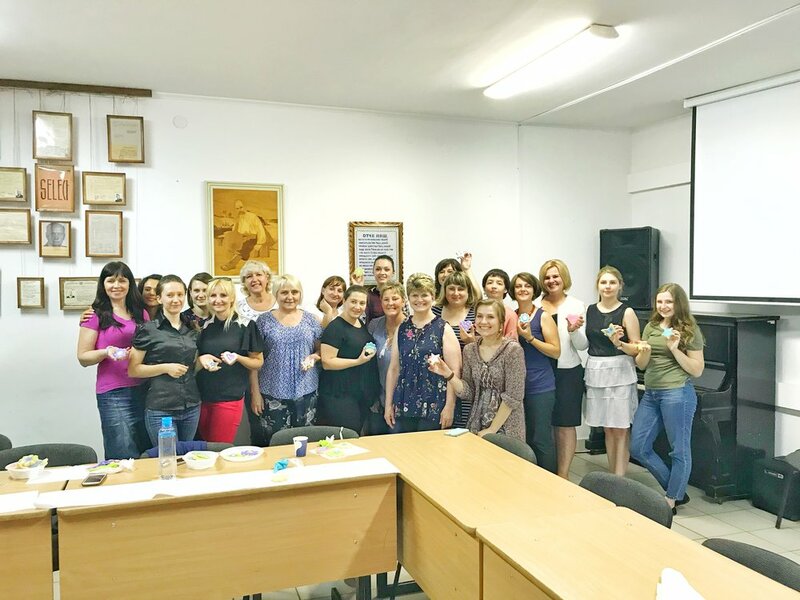 Cookies on Mission to Ukraine! Cookie Challenge Entry & I reached my Cookies With A Mission goal!!!!!! Here are the simple and small cookies that I took on our Ukraine 2017 trip. To read about the actual trip, check out this blog post. I need to take at least 150 cookies, so they can't be too big. And since I'm making so many, I want them to be as easy as possible. After CookieCon 2017, I branched out and tried The Painted Box's gorgeous watercolor techniques. Angela was especially helpful to me and answered all my questions. (Thanks Angela!) So it seemed fitting to decorate some watercolored cookies since the total decorating time is fairly minimal....especially when you're just dabbing on a rainbow of colors. 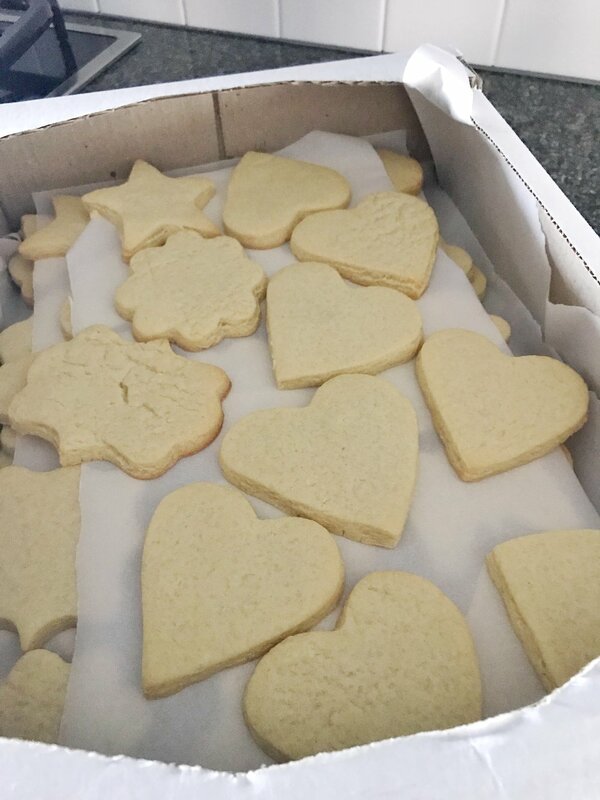 For these cookies I flooded all of them with white glaze and let them dry overnight. The cookies were well received and brought many smiles. Our team had the privilege of going to Ukraine again this year......our TENTH trip! It was filled with building more life long relationships and nurturing those that we've made in the past. What a privilege to go to make a difference through each smile, each hug, and even each cookie.....spreading love as far as we can. There were 204 small cookies in my checked bag that I had the joy of sharing with many people. The smiles in response were worth all the time and effort made throughout the year to raise the funds to go and to shower the people with physical and spiritual gifts. This year we held the SEVENTH ladies camp......and it was the biggest and the best. We heard multiple comments about it being the best one the ladies had attended so far. There were 94 women present, and the classes and activities offered were a huge blessing to all. 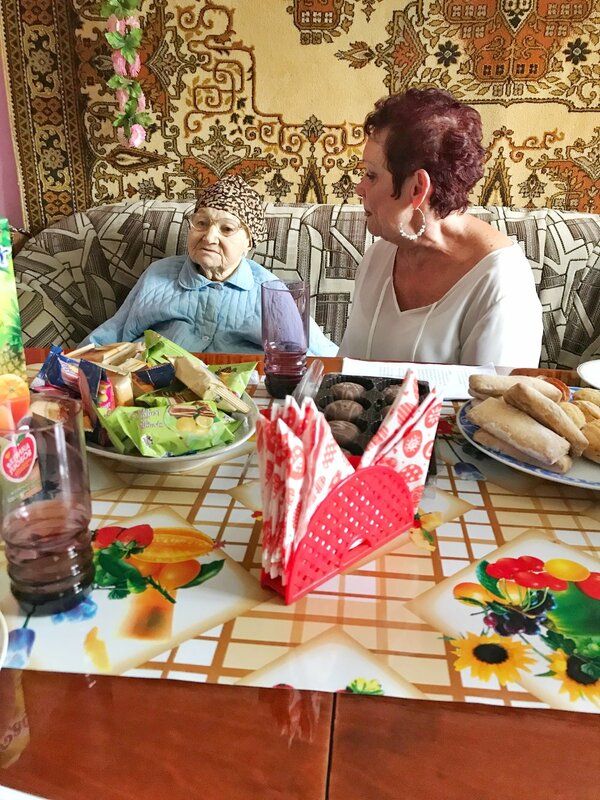 Next we went back to Borislov and spent several days encouraging believers and doing all we could to share love and kindness to as many as possible. Each year it becomes abundantly clear that THEY give us so much more than we give them! The end of June is raspberry, strawberry, and currant season.....we received many of these beauties from our beloved friends. Gayla is a new friend that God brought into my life this year. She is from Belarus. What a blessing! The visit I had with this family was probably the most significant moment for me during our 2017 trip. This family of eight is from Eastern Ukraine and had to flee their home when the war began more than three years ago. They live in a tiny home (for 8 people!) that is not in the best part of town. But you would never know their circumstances by just being around them. They are one of the most loving and content families I've ever seen in my life. And they blessed my heart so much. Say a prayer for them......they have a ton of obstacles they must work through. But God is at the forefront of everything they are doing, and I'm honored that I got to spend time with them while I was in Ukraine. And finally, I thought it would be essential for me to share with you how powerful a cookie is. Each year that I go to Ukraine, I take cookies to share with all the dear ones that we visit or come in contact with. A few of the widows have received nearly one of every cookie I've brought. During this year's visit, two of the ladies showed me their "stashed treasures". These are cookies that are years old....probably not even edible, but they treat them with love and care. Cookies really do make a difference. Cookies express love and bring joy. Thank you to all of you who have supported me over these last ten years. It is making a difference in a small little town on the other side of the world. I am forever grateful that God has given me this privilege.